A Brief History Lesson a la Suntour : Bikes. Rants. Adventures. I'm probably looking at your bike. If you see me awkwardly staring in your direction with a glazed over look and my mouth hanging slightly open, it's because I'm analyzing the parts on your ride in my head. 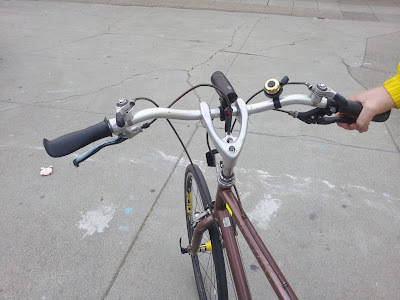 Because of this social awkwardness (or awesomeness) I tend to notice little parts and bits on bikes that are more unusual than others. I complemented a guy once on his twisted spoke lacing and he said I was the first person to notice it - I just thought it was cool. 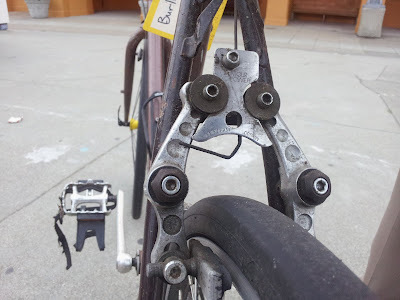 So it was no surprise when I ran into a rather nice fellow commuter and noticed his brakes (or rather ran into him because of his brakes), which he was gracious enough to let me photograph. Having rarely seen this sort of brake and never before with a Suntour logo, I had to ask about it. I learned that apparently a man named Charlie Cunningham of Marin had developed these types of brakes, known as roller cam brakes, and that Suntour had made them for a short while. Roller cam brakes are interesting in their own right, and these especially caught my eye as they were nothing like what I was used to seeing from Suntour. Apparently they did other parts too. I didn't get a great look at the stem, but he said it was also a Cunningham/Suntour design. This gentleman told me that people often offer him large sums of money for his bike, which has all original stock. He says he's had it for years and just loves to ride it. I don't know if these really are rare, or if this is a well known fact, but I certainly knew nothing about it. I love that I can learn something about bikes just about every day. The first thing I noticed was the rear brake setup - that's pretty fascinating. I like how the frame was built to accommodate the cabling like that! Gotta say I dig the bike overall. Seems like it's in good condition and well cared for.